Comments – A cattle farmers dream! 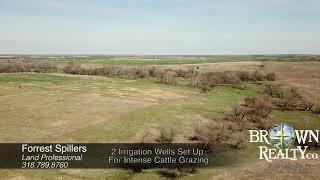 Located 8 miles east of Helena, OK this 147-acre tract is setup with Intensive grazing in mind. The 44 paddocks on the property are sectioned off in 3-4-acre tracts with electric fencing and planted in a variety of forages such as Bermuda, Johnson Grass, Clovers, Alfalfa, Vetch, Mutua, Rye grass and Native grasses. The farm has two irrigation wells that allow easy access to water throughout the property allowing the cattle water year-round and keeping the farmer worry free during dry seasons. Without using chemical fertilizers or pesticides since 2000, the farmer has greatly increased the organic matter in the soils making year-round grazing an option. With standing hay in the winter, the farmer has had no need to purchase cubes or hay for the cattle. The beautiful creek and mature hardwoods that run through the property also provide some hunting on this property! Seller has a 3000 sq. ft. building with living quarters, central heat and air and a certified commercial kitchen and a 1000 sq. ft. Certified Grade A dairy barn that can be purchased as well.